Beckum, Germany – BEUMER Group, a single-source provider for filling, palletising and packaging technologies, develops complete packaging lines with perfectly compatible components. The right palletising technology is key to achieving optimally packaged load units and for the secure transportation of bags, buckets, packages or canisters. As a system supplier, BEUMER Group customises these systems, both the BEUMER paletpac and the BEUMER robotpac, to match the individual customer’s needs and takes product characteristics, packing patterns and pallet sizes into consideration. Both systems handle the items with care and stack them in an optimal pattern. Products of the industries food, (petro)chemical, building materials and other consumer goods are stored in special bags, barrels, canisters, cartons or buckets. BEUMER Group offers different solutions, depending on the packaged items. The BEUMER paletpac is suited best for bulk material. This construction series stacks the bags, that might have been filled by a BEUMER fillpac FFS, in a stable and precise way on the pallets. The bags are made out of paper, polyethylene or polypropylene and are available in two different designs: flat valve and valve bottom bags. The BEUMER paletpac creates precise, stable, space-saving bag stacks. The high-capacity machine palletises bags up to a pack height of 2,400 millimetres, in every technically possible packing patterns and on any commonly used pallet size – including intermediate sizes such as 1,400 x 1,200 millimetres. A multi-program interface enables the user to set parameters easily and quickly. The machines of this construction series can palletise up to 2,500 bags per hour, the high-capacity version up to 5,500 per hour. The twin-belt turning device offers a tremendous advantage over conventional turning processes. The BEUMER paletpac can be provided with a bar-type, clamp-type or twin-belt turning device to position the filled bags quickly, ensuring their dimensional stability. The latter offers a great advantage compared to conventional turning machines, because the system’s components move the bags without mechanically deforming them: “Two parallel driven belt conveyors move at different speeds and turn the bags quickly into the desired position,” explains Baumeister. The intelligent control of the twin-belt turning device also takes the dimension and weight of the filled bag into consideration. Exact positioning, specified by the preset packing pattern, is achieved. No adjustment is necessary even with a product change. Creating precise patterns during the layer and stack formation result in stable bag stacks. Multiple pallet loads created with the BEUMER paletpac can even be stacked one on top of the other to save storage space. The modular structure permits adaptation of this series to special market- and customer-specific requirements. 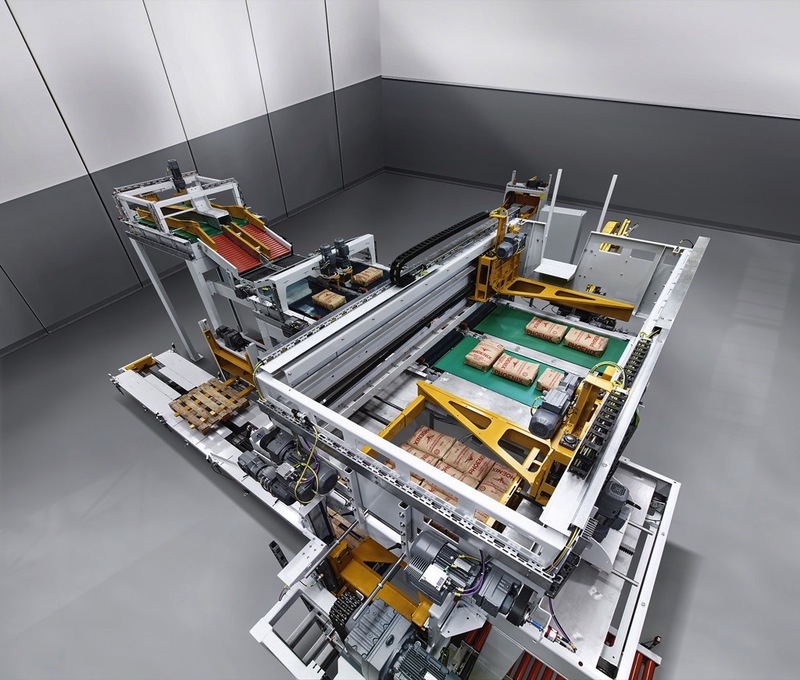 Bags stacked accurately on pallets can then be transported successfully to the downstream packaging system – for example, the BEUMER stretch hood. The BEUMER robotpac series palletises and depalletises a wide variety of packaged goods with specially designed gripping systems. The fork gripper was designed for palletising bagged goods and cardboard boxes. It picks up the packaged item from a take-away roller conveyor and secures it using a holding-down device during transport. Once the target position on the pallet has been reached, the gripper opens the fork with a horizontal movement. A push-off plate helps the gripper to place the item gently and accurately. The double fork gripper was also designed for palletising bagged goods and cardboard boxes. It can pick up two packages from the double take-away roller conveyor. Once the first package is placed on the pallet, the BEUMER robotpac lifts the fork up again and drives to the second target. The placement occurs consistently with the first fork’s stacking process. Then the palletiser returns to the pick-up position. The finger gripper has been developed for bagged goods. It takes the bags from hoist equipment on the take-away roller conveyor and carries it to the target position. Here, the fingers open while the slide plates remain in a closed position. This ensures that the bag is guided along the sides during the stacking process. The double finger gripper is a high-performance tool developed and designed for maximum palletising capacity. The parallel gripper is a special tool for palletising cardboard boxes and other dimensionally stable containers with parallel side walls. The essential components are a fixed plate that functions as a limit stop and a pneumatically activated clamping device that pushes the cardboard box horizontally against the fixed plate. The gripper is specially designed to handle all items with surfaces that need to be suctioned. The suction gripper can generally handle any item with a fitting surface. Bagged goods belong to the most frequently palletised products. 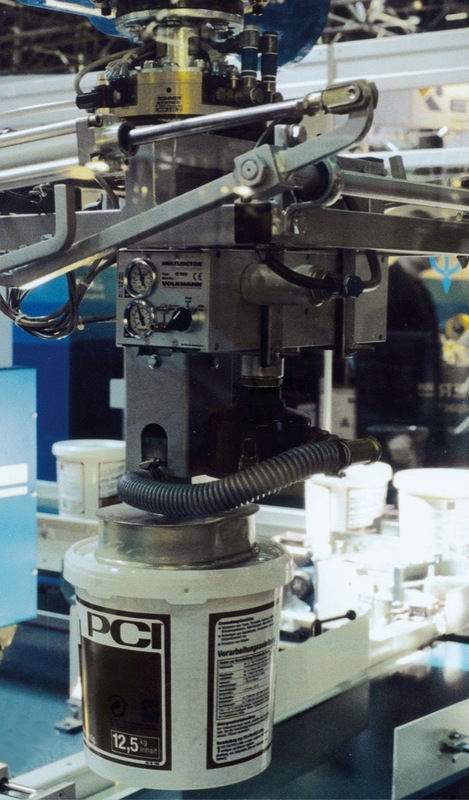 The head of the suction gripper moves over the product and is then lowered until it seals tightly with the product surface. The vacuum pump starts and creates a vacuum in the suction head. The bag is picked up and transported to the target position. Air is released into the suction head and the bag is released. The suction gripper is used for low palletising capacities. 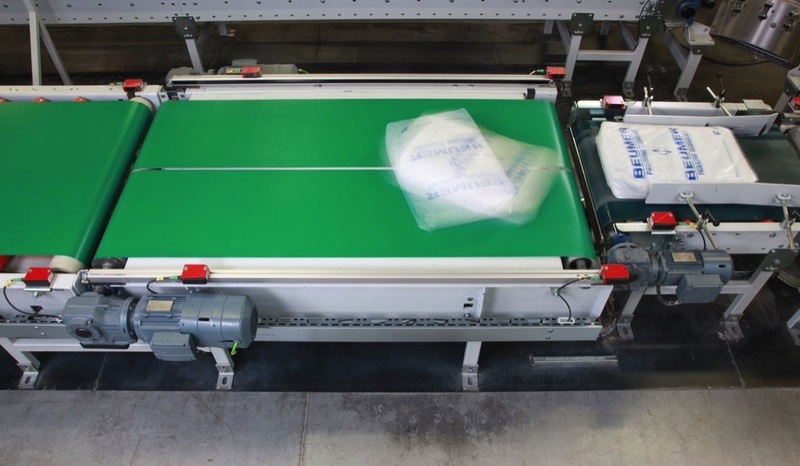 The BEUMER paletpac and the BEUMER robotpac are equipped with the Machine Interface (HMI). Its optimised user interface and navigation makes the operation of the palletisers simple and quick. “The users don’t need to have any robot-specific knowledge to operate the BEUMER robotpac with the HMI,” explains Baumeister. Operators are provided with an easily understandable and intuitive interaction concept, enabling them to define efficient working sequences. This also saves time and money because the operator can control the machine safely, independently of prior skills, training and capabilities. 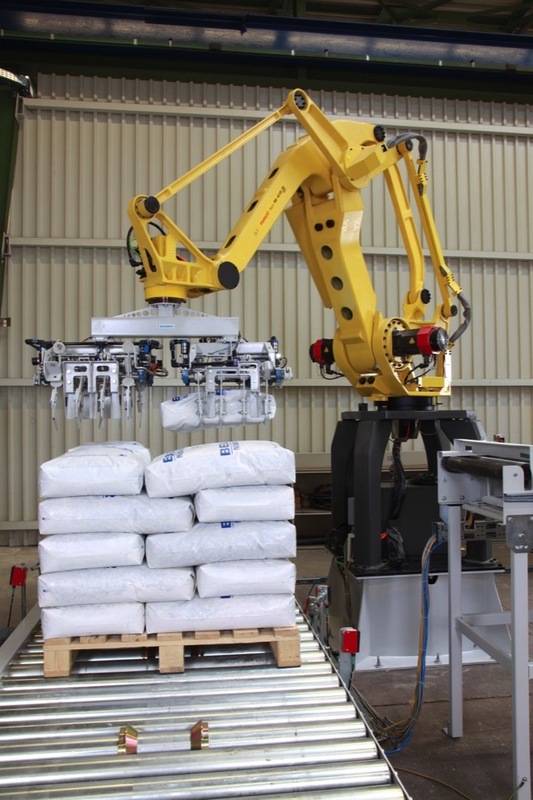 Baumeister gives an example: “Regulated by complex control mechanisms, the BEUMER robotpac can stack packaged goods of variable dimensions on one pallet. You can change the program at the touch of a button.” The items are stacked gently and securely, this ensures optimally packaged load units for safe transportation.